The kryoconnect direct connection kit allows to directly connect two graphics card waterblocks (kryographics series) and can be used for SLI or Crossfire systems. 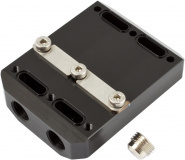 The kit comes with a connection block made of Delrin which replaces the connection blocks of the individual water blocks. The graphics card may have a spacing of two or three slots (meaning one or two slots remain unused between the graphics cards).The unused connection can be sealed with a stainless steel plates which is included in delivery. 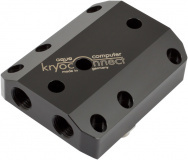 A sealing screw is also supplied and can be used to determine whether the waterblocks are connected in parallel or in series. Works with one or two unused slot between the PCIe slots. Water blocks, graphics cards and fittings are not included in delivery, please order separately. Threads are G 1/4. SLI/Crossfire operation is also possible without this conversion kit using bent fittings.